This all-encompassing volume assists nursing students and beginning-level RNs in developing a practical understanding of infection control issues as they relate to many different areas of health care. The Illustrated Guide to Infection Control covers every infection control topic, from basic hand washing, immunizations, infection control in critical care, infection control in labor and delivery, and medical waste disposal, to methods of surveillance, and everything in between-all in one volume. 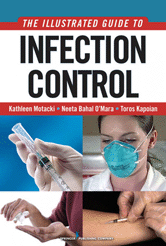 Written by experts in the respective fields, each chapter offers important insights on protecting patients, families, visitors, volunteers, and health care providers from infection. Illustrations are provided to help demonstrate the topics presented, and chapters contain questions and answers with rationales for students to reflect upon.